TeslaElon Musk is under growing pressure to have Tesla meet its production targets, and turn a profit. Tesla’s decision to cut 9% of its workforce is a sign the company’s cash crunch is getting serious. They come as Tesla is struggling to ramp up production of its Model 3 to the point where it can generate cash so the company won’t have to go back to the public markets again for more funds. There’s good reason to believe Tesla will see further delays in meeting its production goal – which could mean more cuts or yet another return to the public markets. The layoffs Tesla announced Tuesday shouldn’t come as a surprise. Similarly, you shouldn’t be shocked if the company makes other dramatic moves in the coming months. You see, Tesla CEO Elon Musk is caught in a kind of bind. His company is haemorrhaging cash as it has been struggling to ramp up production of its new Model 3 car. The company has said it won’t start generating profits from the vehicle until it’s making 5,000 of them a week; at last check, it could sustainably make only 3,500 a week. At the same time, Musk has essentially promised investors that Tesla won’t have to go back to the public markets for more funding because it will start generating positive cash flow by the third quarter this year. So, cash flow has become all-important at Tesla, and if the company can’t get its production up to its target, it’s likely to be looking for more places to cut. Tuesday’s job cuts, which Musk vaguely forecast on the company’s earnings call last month, were fairly steep as these things go. Tesla announced it would cut 9% of its workforce, or more than 4,000 of its 46,000 workers. Company representatives declined to say how much Tesla expected to save from the job cuts. In a statement, Musk made a point of noting that Tesla wasn’t laying off any production workers as part of the reorganization. Instead, he said, the layoffs will “almost entirely” hit salaried workers. If you assume for a nice round figure that those salaried workers make about $US100,000 a year, the company could save $US400 million a year as a result of the cuts, or about $US100 million a quarter. Unfortunately for Musk, his company has been burning through a heck of a lot more than that. In the first quarter, Tesla’s free cash flow – the amount of cash it generates and has available to fund its operations minus what it invests in things like property and equipment – was negative to the tune of $US1.1 billion. That’s after the company’s free cash flow was in the red by $US4.1 billion last year. That’s got to be disconcerting for Musk and his colleagues, given that by the end of the first quarter, Tesla had less than $US3 billion in cash left – or fewer than three quarters’ worth at its first-quarter burn rate. Musk has been able to keep Tesla afloat in large part by repeatedly returning to the public markets for more funds, whether by selling stock or issuing new debt. Last year alone, Tesla raised $US400 million in a stock offering. It netted another $US3 billion by issuing debt – after paying off older notes. But there have been signs investors are growing tired of this game and want Tesla, which has never posted a full-year profit, to finally show that it has a sustainable business. It’s clear that Musk is starting to feel that pressure. In his note to employees, he said as much. Musk has repeatedly said the Model 3 is the key to creating that sustainably profitable business. The vehicle was touted as the company’s first mass-market car, and the company has clearly hit a nerve with the public, with preorders topping 500,000. The company hopes to eventually make 10,000 or more a week, but right now it’s shooting for 5,000 a week, the point at which Musk says it will start making money from it. 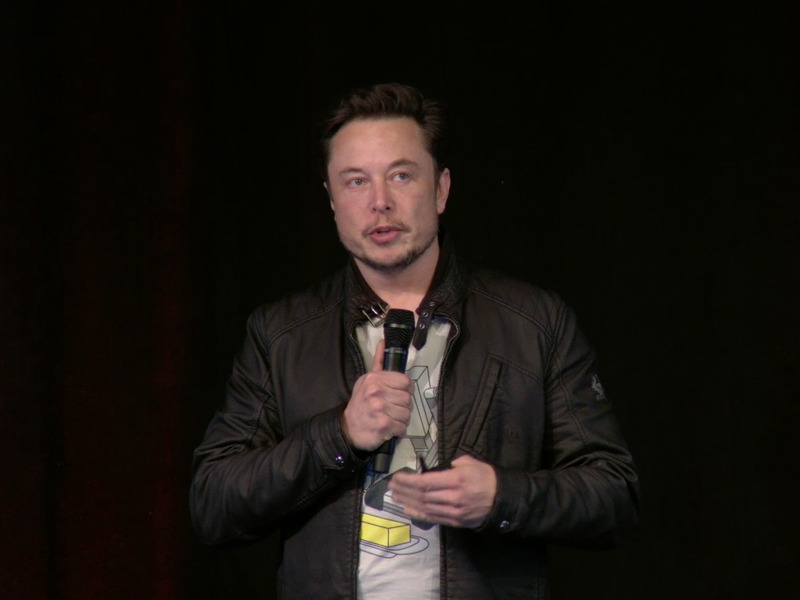 The 5,000-a-week goal is finally in sight, Musk said at the company’s annual meeting last week. The company expects to hit it by the end of this month. Assuming that works out and the 5,000-a-week total is really what’s needed for the company to start generating cash, that timeline would be right in line with Musk’s forecast that Tesla will start generating a profit in the third quarter. Also, Tesla has had a, shall we say, loose definition of production rates. When Musk has announced that Tesla has hit a certain level, sometimes he seems to have meant Tesla hit that for a day and is extrapolating out over the course of the week. Other times, the company may have reached that level for a week or two but wasn’t able to maintain it for an entire month. Additionally, it’s unclear whether Tesla really has a firm grasp on the economics of each Model 3. The company’s Gigafactory production facility has been wasting up to 40% of the raw materials that go into its batteries, according to a Business Insider report, costing the company $US150 million this year. That kind of waste level is bound to increase the costs of each car – making it harder for Tesla to turn a profit on them. If Tesla can’t meet its production targets on time in a sustainable way or cut down on the waste it’s generating, its path to posting profits will be extended again. That could force the company to go back, hat in hand, to Wall Street yet again or make more – and even more painful – cuts.